As I have said many times, it is the franchise model that has allowed Edible Arrangements to become a global icon while, at the same time, creating opportunities for our many franchisees to become owners of their own businesses and pursue the American Dream. The International Franchise Association is the world’s premier organization for franchisors, franchisees and industry suppliers. Having been an active member of the IFA for over a decade, I’ve had the opportunity to meet many of the brightest and most creative leaders and entrepreneurs. In 2009, I was honored to receive the IFA Entrepreneur of the Year Award. Now I have the opportunity to work with the organization at the highest possible level as we shape franchising’s future and work to protect the franchise model and educate the public and policymakers about the contributions that franchising makes to our nation and around the world. The Future Of Franchising Is Digital . . .
Another thing that excited me during the weekend was seeing how technology is changing the face of franchising, especially as the millennial generation begins to take its place among franchisors, franchisees and industry suppliers. I have had the opportunity to be involved in the IFA’s NextGen program the past two years and I am inspired by the enthusiasm and creativity of these young people, who have been raised on companies with dynamic new business models such as Apple and Google, as they mesh their business ideas and plans with franchising. From general sessions to workshops to hallway conversations, it was clear that the emergence of new, digital technologies is top-of-mind for everyone as we witness first-hand the changes in how consumers make their buying decisions and discuss ways that franchise companies can address those changes. As a self-proclaimed tech geek and someone who embraced technology and the critical role it could play in the growth of Edible Arrangements from the very beginning, it is always exciting to see the latest and greatest advances. But it was even more exciting to know that our technology company, Naranga, will be at the forefront of driving many of those advances in the coming decade. Our booth had a non-stop stream of companies interested in the various solutions we offer. It is clear that we have an opportunity to take a leadership position in helping companies in a variety of industries take full advantage of the digital revolution. 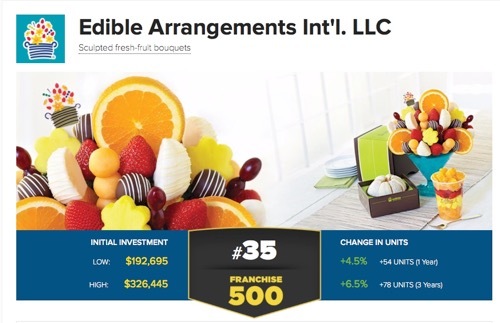 On Sunday morning, as I looked out over the convention floor at the thousands of attendees at this year’s event, it was amazing to realize that when I launched Edible Arrangements back in 1999 I didn’t even know that franchising existed. Today it is not only a primary reason that I have been able to experience the American Dream, but it has become a massive economic force. And not just in the United States! No longer is franchising an American phenomenon. In fact, many of the greatest opportunities in franchising now exist beyond our borders as people across the world are eager to learn about franchising. Today franchising is truly global, which brings even greater responsibility as well as new opportunities for the International Franchise Association to expand its presence worldwide. And I am very honored that I have been given an opportunity to play a role in making that happen.